A Welsh girl in Australia: A quiet proud moment. Another school year over, another chapter completed. I came back from my trip to Melbourne in time for the last school assembly of the year. Each week, the children start the school assembly by standing to sing the Australian National Anthem and they are accompanied by a small recorder and percussion group from the older grades. Sibs loves anything musical and a few weeks ago asked her music teacher if she could have the anthem music score to play at home. Her lovely teacher then asked if she wanted to join the older children in the last assembly of the year to play along. She dutifully practised at home (sometimes at some ungodly hour - sorry neighbours!) and then yesterday skipped along to stand at the front and take her place with the band. It was a quiet proud moment - no certificate or principal recognition, but a very proud shared moment between mother and daughter. We knew. How absolutely lovely and we can so well understand how proud you must be of your daughter. 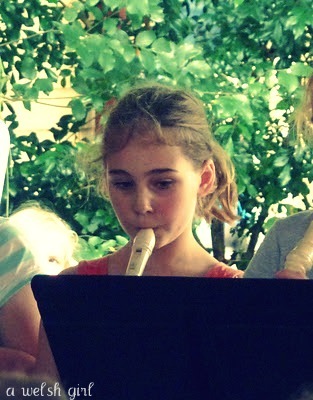 It is so good when children are musically inclined - something to be very much encouraged for to play an instrument is such a wonderful talent to possess. This is Gold Beth. Certificates are not everything. My kids are grown now but their every little achievement still lights up my world. lovely Beth, at the moment both of mine are preparing for Christmas concerts. Owain is the only boy in the primary school choir but he loves it. Aoife looks a delight in her 'citizen of Bethlehem' costume. Next week should be full of fun!! It's a tribute to the good character of your daughter that she was self motivated and played just for the love of it. I used to love those special shared moments. Well done to your daughter.